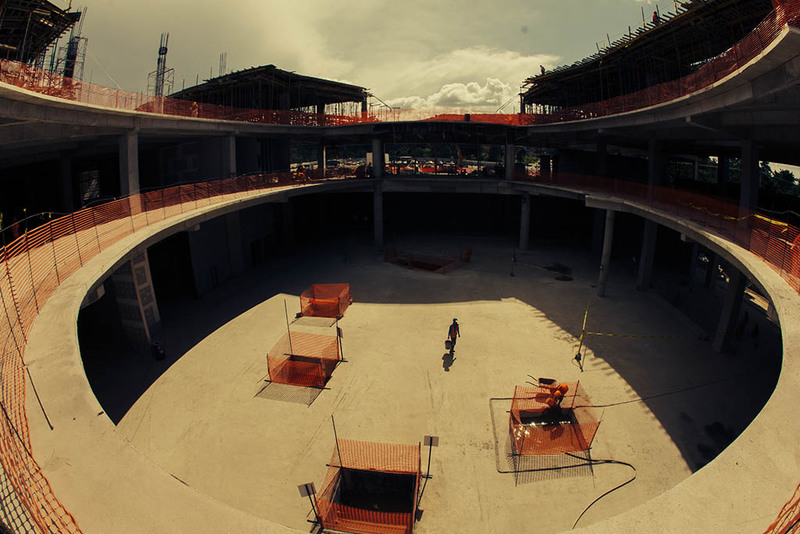 Guatemala City, Guatemala—Retail real estate is about to get a major makeover in Latin America. Investors, national REITS, and Latin American developers are replacing aging and energy-inefficient shopping centers with new, LEED-certified spaces. Driving that change are the demands of the growing middle class for an urban destination featuring shopping, leisure and entertainment in a safe and comfortable environment. These new spaces also reflect the tradition of central plazas in historic city centers, providing a connection to nature and a space for people across the city to come together. Today, there are over 239 retail projects in Latin America and the Caribbean, representing over 41 million square feet or 3.8 million square meters of LEED space. Although Mexico, Brazil and Chile continue to be the regional leaders, in 2015 alone we have seen 50 new LEED projects across 12 countries in Central and South America. Established sustainability and multinational retail leaders such as Nike, Starbucks, Citibank and Falabella continue to achieve LEED for their stores across the region. In 2015, we’ve also seen relative newcomers such as H&M and the Hard Rock Café, as well as a host of national brands and owners. Perhaps the most exciting news is the growing footprint of LEED retail buildings in Latin America. There are 16 LEED-certified projects, each representing over 100,000 square feet, but more than twice that number registered, and there are three retail projects that are each larger than 1 million square feet. More space, more people, more impact: each project affects tenants, workers, staff and visitors as hundreds of thousands people a month visit these projects. For LEED and sustainability, it’s a big impact for smaller countries and economies in Central America. Spectrum, a major Guatemala developer with properties in Honduras, Nicaragua and Colombia, is currently pursuing LEED certification for both the Oakland Mall Lifestyle and Naranjo Mall projects. Naranjo Mall alone has created over 2,200 green construction jobs, and the retail center will employ an estimated 1,500 people. Carlos Ramirez, Director of Development, also insisted that Spectrum “walk the talk” by achieving LEED Gold for Spectrum’s corporate offices. 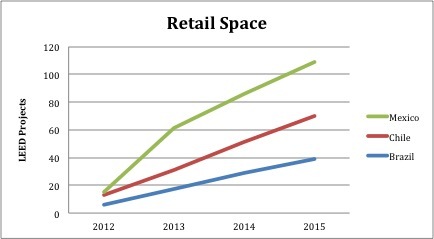 The growth of LEED retail space in Latin America actually comes as no surprise. McGraw-Hill’s Green Retail and Hospitality Smart Market report predicted that the percentage of retail owners using a green building rating system would grow to over 52 percent by 2015. Additional market reports and experts have concluded that transparency and brand alignment with consumer values matter to shoppers. And as Latin America’s middle class continues to grow, retailers who create jobs, protect and enhance the urban environment and provide a better, greener building should expect to be rewarded for their leadership and sound investments. 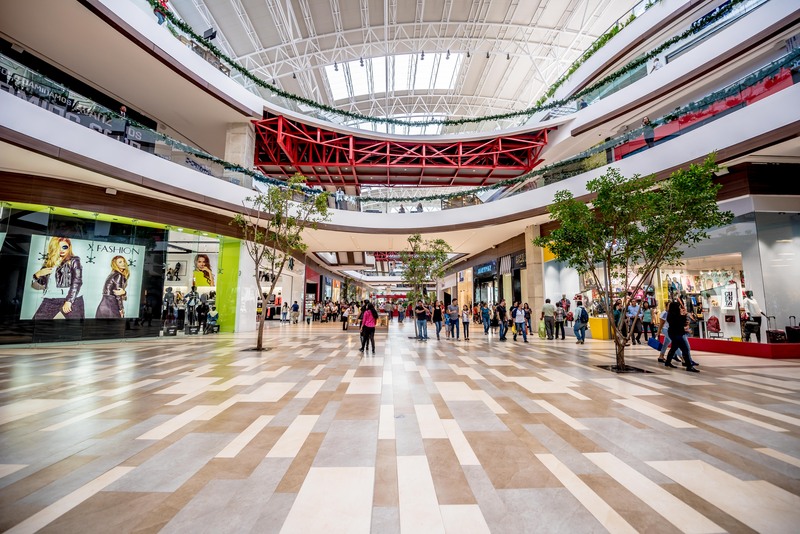 The International Council of Shopping Centers also predicted that 2015 would be a robust year for retail development in Latin America, with millions of dollars of investment flowing to projects, including estimates of $230 million to Central American projects. ICSC went further in its optimistic predictions for the sector, citing retail advisor Jorge Lizan, who called 2015 the “best historical moment” for the mall industry of Latin America. The growing middle class, political stability, stable economic growth and access to capital all point the way to continued growth for 2016. In fact, MacRumors has just reported that Apple is planning a major retail expansion into malls in Latin America. Meeting the demands of retailers and developers for LEED-certified shopping space are companies like Medio Ambiente, with LEED Fellow Andrés Prera and Julio Alvarado. Their firm, along with Kath Williams & Associates as senior consultant, provides end-to-end design-build services with a focus on sustainability, ecological design and urban green development and was a founding member of Guatemala GBC. January is a month of resolutions and predictions for the coming year, and here is mine: Latin America’s retail sector has the financial means, leadership and green building expertise to continue on an upward trend. We can expect great things and continued market transformation in 2016.